In the late summer of 1981, I had just turned 14 and was about to enter my sophomore year of high school. My brother was almost 17 and going to be a senior. My favorite band at the time was Styx — I played the grooves off my copy of Pieces of Eight. I never thought they could top that album with all of it’s classics: Renegade, Blue Collar Man, Queen of Spades. Their next album, Cornerstone, was kind of a disappointment despite having the coolest album art and disk jacket ever created. But when Paradise Theater was released, and I bought it from Sundance Records on release day, I was blown away by the opening track. The timeless piano and rich vocals that led surprisingly and seamlessly into one of the coolest guitar riffs to open a song. Despite some admittedly cheesy lyrics (“Let’s get together and futurize our attitudes”), the song absolutely rocked. By the time Tommy Shaw’s solo kicked in, I was sold. It’s always been one of my favorite opening album tracks, and I think it holds up pretty well over time. 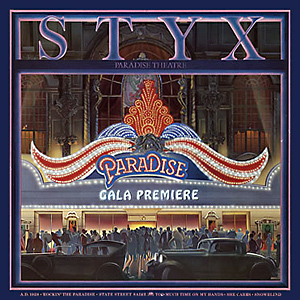 That fall, right before school started, my parents amazingly let me and my brother drive down to San Antonio to see Styx in concert during their Paradise Theater tour, and A.D. 1928/Rockin’ in Paradise was the very first song I saw performed live by a rock band. I was mesmerized. The whole show was revelatory to me, and watching them perform was the first seed of my desire to play guitar. Tommy Shaw strolling down the aisles during one of his extended solos as audience members reached out and touched his clothes was such an iconic rock star moment that I couldn’t help but want that for myself. Of course, I never got to that level, but I certainly got close enough that I can know how he felt. The solo in Rockin’ the Paradise is not Shaw’s most difficult work, but it’s got a great bluesy feel that I feel will be fun to try to match. I admit that I’ve already been practicing it, so I don’t think it will be too long before I have a recording done. Here’s Tommy Shaw’s Gibson Explorer that he played in that concert (maybe not the same one, but the same style). He’s since switched to a Les Paul, but I’ll always remember him as the skinny kid with the David Cassidy haircut and the black and white Gibson Explorer. Tabs: http://www.hot-tabs.com/download.asp?Tabid=10533 — this is a PowerTab tab, which requires special software. I could not find text-base tabs that included the solo. These tabs are not 100% accurate, and I ended up buying a Styx songbook that included tabs for the song, including very detailed tabs for the solo. I could not find any instructional videos or backing tracks — I made my own backing track by EQing down the lead guitar, which works ok but is not ideal. Here’s a video of Styx in 1981 performing Rockin’ the Paradise in concert (in Japan) — this is the closest to my memory of the San Antonio concert.